< Just another epic day snowshoeing on Mt. Hood, Oregon! This photo was taken on Friday and I was snowshoeing along the White River. If there is enough snow and if the upper parts of the creeks are snow covered, you can cross over the creeks on a number of snow bridges and then continue up another mile or snow. You can get up to about 8,000 feet, where you can then see Mt. Jefferson and parts of the Three Sisters. As you can see, the skies were blue and Mt. Hood was looking stellar as always. I was a little concerned since there were some really nasty rain clouds in the lower elevations and I thought that they were going to eventually ruin my epic journey up the cairn. I was pleasantly surprised that the weather actually improved as the day moved along. The clouds eventually left most of the Cascades and I was able to view Mt. Jefferson and the Three Sisters without any threats of clouds blocking my view. However, the day earlier, rain and snow blanketed the mountain witch made the snow crunchy in some areas and downright knee deep in others. There were a lot of snow drifts and I ended up in hard and crunchy snow one second and then found myself buried up to my knees the next second. I have never experienced conditions like that but we haven't had a very cookie cutter winter either. 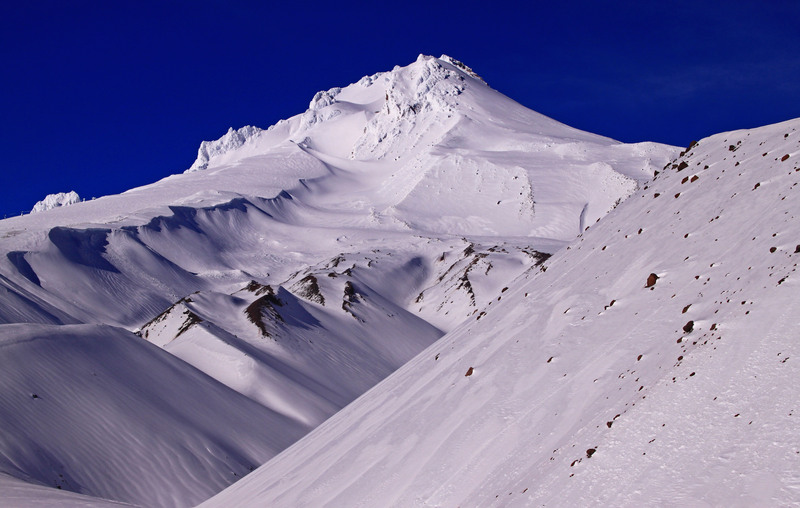 I was pretty sure that I would see or hear some avalanches around me since the temperature was hovering around 50 degrees but luckily I never had any problems with loose snow. 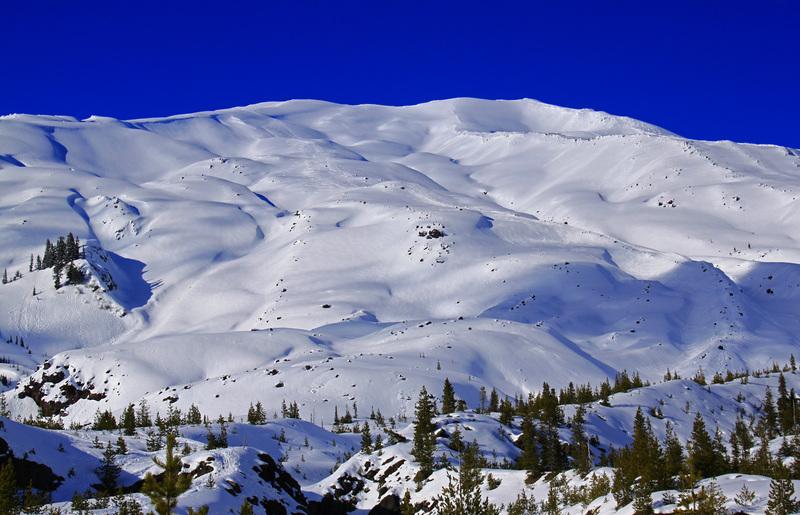 I could see where some small avalanches had taken place but I never had any problems or close calls. My dog had a pretty rough time getting through the knee deep powder but overall he was able to keep up. He did finally figure out that it's a lot easier to just walk behind my snowshoe tracks but he always seems to want to be either beside me or in front of me. The other day, someone asked me to tell them which was my favorite hike near or on Mt. Hood. It took me a second but then it soon dawned on me that there is only only hike that towers over all the rest. 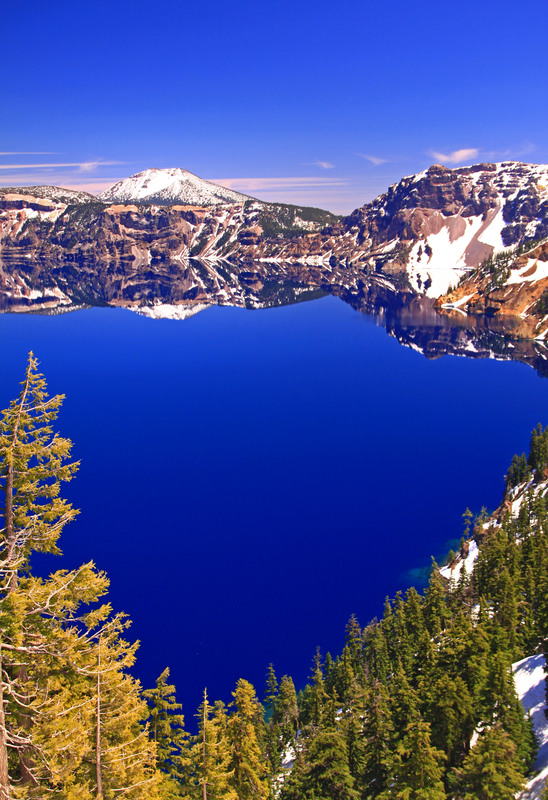 This hike offers everything that you wold expect from a Volcanic mountain should. I immediately explained to them that it was the Elk Meadows hike. I then explained to them that you also need to hike past the Elk Meadows trail and head straight up towards Mt. Hood, which becomes the Gnarl Ridge trail. This epic hiking trail offers everything that a wilderness hiker would love. 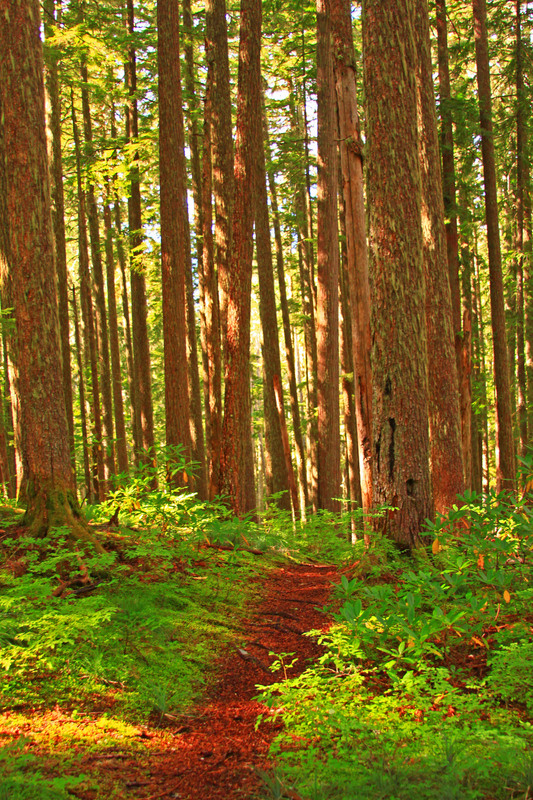 You hike among an ancient and pristine forest, cross over several creeks and rivers. You even have the chance to cross along a wooden bridge that spans over a recently melted glacier. You can walk along an alpine meadow with millions of flowers dotting the bogged grassland. Once you leave the Elk Meadow trail, you then get the chance to explore the Gnarl Ridge trail and it’s impressive. You will immediately notice the elevation gain within just seconds. The trail shoots straight up as you hike through the tall trees. 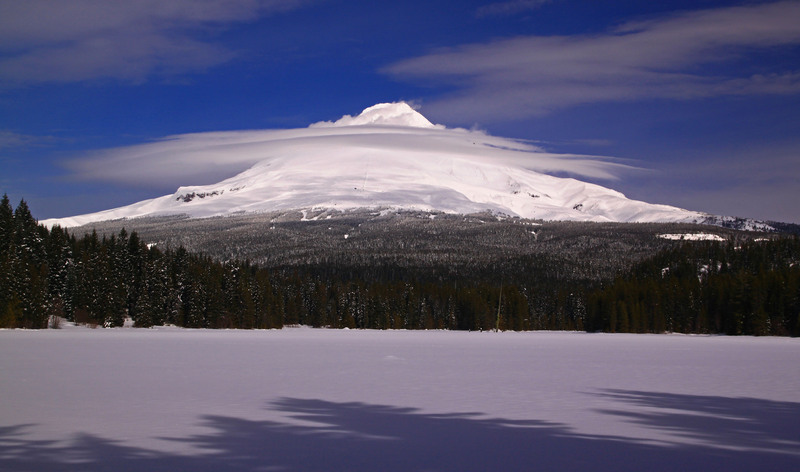 Your ultimate goal is to get to the summit of Lamberson Butte. 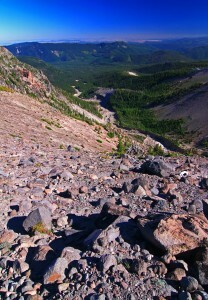 The photo that I provided was taken from the Lamberson Butte viewpoint. With it’s elevation at 6,500 feet, you will realize that you have hiked over 2,030 feet of elevation gain. Before you can get to the top of the butte, you may have to traverse along a very steep and difficult part of the butte if it’s still covered in snow. However, if there isn’t any snow, you won’t have to worry about anything. The trail is just below an overhang and below the trail it’s a pretty steep drop, so if there is still snow, the trail may be buried and you may have to slowly navigate your way around this sketchy part of the trail. Once you get to Lamberson Butte, you will find yourself with a pretty spectacular view. You can see Mt. Jefferson and the Three Sisters in the south and Mt. Adams and Mt. St. Helen’s towards the north. Mt. Hood stares you straight in the face as you gaze due west. Alpine flowers grow in some of the most precarious spots along the volcanic covered earth. Huge boulders are spread out across the volcanic landscape and you can hear and see some of the boulders crashing down all around you. Gnarl Ridge is an unforgiving and massive cairn just below from where you will be sitting and the glaciers high above created the cairn that created Newton Creek. This is the creek that flows under the wooden bridge that you will be crossing during the early part of your hike. There are several glaciers on the eastern slopes and many mt. climbers start from the base of Lamberson Butte. It’s a very windy area but you can find some pretty descent cover and more flat stretches just north of the butte. This is a great spot to take a break and have lunch. The views are awesome and you can plan on spending several hours taking photos. Again, if you study the photo, you will notice the many areas that I’ve mentioned. If you want to continue up, you will be able to follow the trail until it disappears under the snow. The snow lingers well into August or September so you will want to plan on bringing your snow shoe poles and maybe even some grip soles or traction cleats for your shoes. 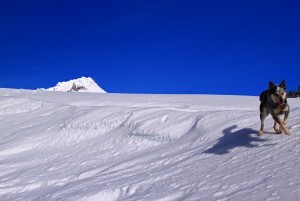 You won’t necessarily need crampons since you will be going from snow to rock several times. I pretty much kept on hiking towards the summit until I began to cramp up and trust me, you will. 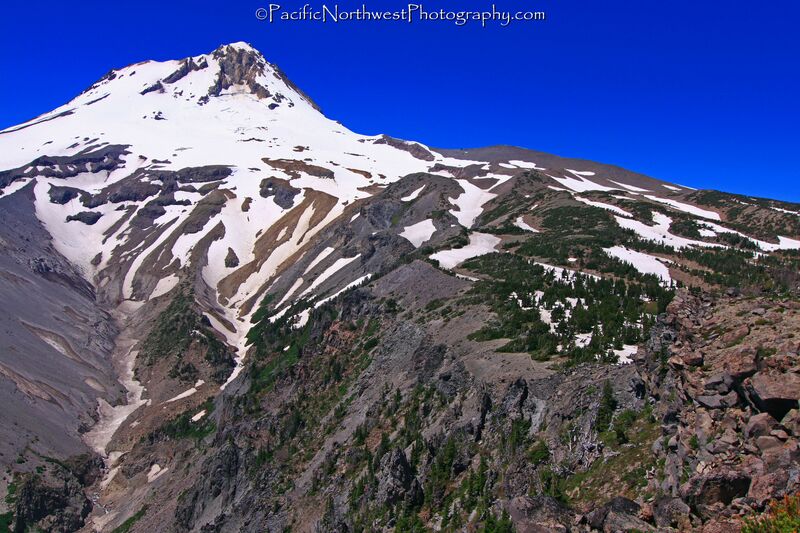 If you look at the photo, you will see that you will be hiking on the right hand side of the summit. You can see that it’s mostly snow and bare rock and the elevation gain is pretty steep. You could pretty much hike until you get to the summit but you will soon find yourself exhausted and starting to realize just how difficult it would be. You could easily cover over 5,000 feet of elevation gain before you even realize it. I would recommend that you bring your dinner with you and plan on eating at your car as well as rest for a while before heading home since you will be very tired, hungry and dirty. There are two places where you can start your hike. They are only a few hundred feet apart and they are both off highway 35. The first parking spot is just a few yards from the Mt. Hood Nordic Center and the other is the Clark Creek Snow Park. Just remember to purchase your parking pass or your annual Northwest Forest Pass. I finally got the chance to schedule a snow shoe trip in the Mt. Hood wilderness. However, last Tuesday the rain was coming down in sheets, just east of Sandy and the rain was even worse around Welches. I was pretty sure that Government Camp was going to be a total bust with nothing but rain. I was pleasantly surprised that the rain had turned to snow just as I was passing by the Mirror lake parking area. Luckily, I was able to find myself immersed in snow flakes the size of quarters by the time I reached the Trillium Lake snow park. I knew that the snow was going to be wet and heavy but that surely beats rain. The entire trip to the lake was a complete whiteout. I wasn’t able to knock the snow off my camera bag fast enough. I was fortunate to bring my front loading camera bag, which really came in handy. 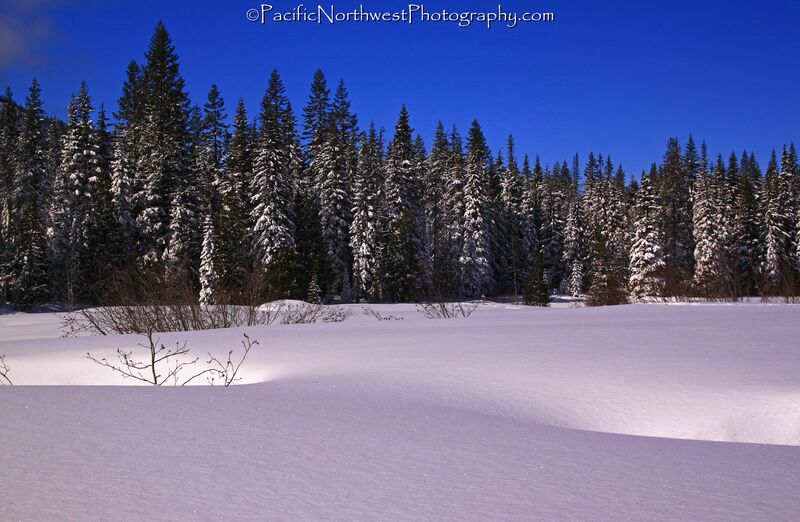 The only way to get out of the snow, to take some tree shots, was to snow shoe in the trees and look for some shelter. However, the snow was pretty heavy and the snow was coming off the trees like water balloons. As far as I’m concerned, snow shoeing during a snow storm is the best time to be out in nature but it’s not easy for taking pictures. You couldn’t even see Mt. Hood once I got to the lake. I wasn’t surprised but I was hoping for a miracle, where the clouds would eventually clear out of the area and I find myself surrounded by snow covered trees and Mt. Hood looming in the background. However, that wasn’t the case but I made the best of it by photographing my dog running around and trying to photograph the snow covered trees in the distance. The photo that I posted wasn’t from this day but from last Sunday, when I came back on a much sunnier and dryer day. The crowds were horrendous but that was expected. It didn’t help that I broke my right snow shoe but at least it was only a few yards from the parking lot. I ended up hiking instead and luckily there were snow tracks as deep as 2 feet and the main trail was packed harder than a rock so I didn’t have any trouble getting to the lake. However, it was a totally different story if I tried to walk in the deep snow. The drought is officially over in the Oregon Cascades and last week was proof of that. It also helps that they are expecting another week of heavy snow. 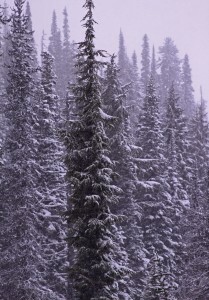 Winter has arrived in the Cascade mountains with a vengeance! The snow pack is almost at 100% and the mountains continue to get hammered with the fluffy white stuff. Just returned from Mt. Hood, Oregon yesterday and was pelted with over 7 inches over the course of only 4 hours. Hard to believe that we are past the halfway point of February and will soon be watching the Spring flowers popping up but at least we can say that we dodged the drought bullet. Also can’t believe that a huge majority of snow junkies have waited until this last storm to even venture anywhere near the snow parks. I wouldn’t want to be an owner of a ski resort or any business that relies on the winter travelers. I can again officially say that I haven’t waited this long to get up to the mountain in my entire life and I hope that the future doesn’t hold any more surprises like this winter. I was even surprised that there weren’t more people flocking to the mountain resorts during the epic snow storm that was pounding the Mt. Hood area. Most of the ski resorts were pretty empty and every snow park was void of any x-counrty and snow shoe connoisseur’s. I can’t imagine how busy the mountains will be this weekend and I really wouldn’t want to deal with the ski crowds on any of the mountains. It may be best to just find a less traveled snow park, get there real early to beat the crowds and plan on looking for some secret trails that no one knows about.